Thursday nights at Casa de Luz are like most nights at Casa de Luz: athletes, nouveau-hippies, and cute kids with names like Merlin quietly munching on kale. Except for one thing: tacos. Made with homemade corn tortillas. Filled with fluffy guacamole and carrots and onions and mushrooms. While much of the food at Casa is utilitarian with a touch of flavor, the tacos are delicious, and in true Casa fashion, entirely organic, gluten-free, and ridiculously good for you. 12 bucks for an all-you-can-eat plate with soup and/or salad. Order at the front counter and get a wooden nickel to exchange at the kitchen counter for your meal. Kale included. Mon.- Sat. 7 am- 9pm, 11:30 am- 2pm, 6 pm- 8:30 pm. 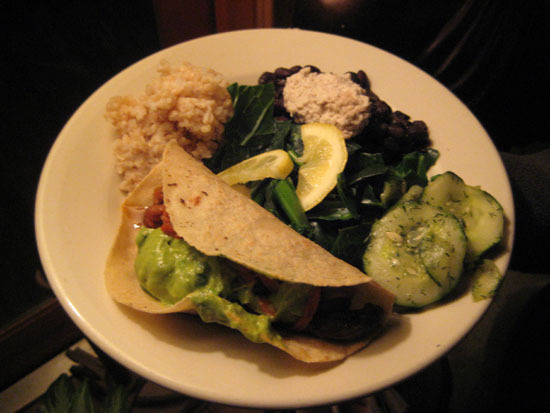 This entry was posted in Cheap Eats, Tacos on February 13, 2008 by yvonnegeorgina.